Oopsie… SHAME on BC Liberals, trying to use a proposed apology for Chinese Head Tax and Exclusion Act, as a ploy to win votes prior to the next election. Waitasec… the Paul Martin Federal Liberals tried to do the same thing back in 2005, but it backfired big time, and it was the Harper Conservatives that made the official Apology in June 2006, after they were elected in January 2006. I know this because, I was also active on the Chinese Head Tax Redress campaign from 2005-2006. I had heard that Liberal MLA’s Richard Lee and John Yap were working on an apology for Chinese Head Tax, similar to the apology for the Japanese-Canadian internment. I know that Richard and John have always been active with Chinese-Canadian Community groups. Richard has attended our Asian Canadian Writers Workshop events in the past and presented “Appreciation Certificates” on behalf of the BC Government. I usually see John at events for the Chinese Canadian Military Museum, and he was the MLA who gave the Chinese-Canadian veterans recognition in the Victoria Legislature many years ago. I know they work hard in the community, but the timing of this announcement for a head tax apology linked with vote-winning is unfortunate. I have been following the issue of the BC Liberals creating an apology for the Chinese Head Tax and Exclusion Act. For the past 2 weeks, I have heard rumblings in the Chinese-Canadian community about a possible apology. However I have also heard that community groups were invited to meetings on very short notice, such as a few days, and they felt this was disrespectful. The Federal process for an apology took place over many months, and this is after it took decades of meetings and asking for a simple apology, not including ex-gratia payments. My grand-uncle Daniel Lee was a WW2 veteran, and part of the successful campaign that helped to repeal the racist Chinese Immigration Act of 1925 that excluded all immigration of Chinese to Canada, resulting in the restoration of voting rights to Canadians of Chinese ancestry. Every year Uncle Dan would sell poppies on the streets of Vancouver, and he would write a letter to the Federal government asking for an apology. 59 years after the restoration to voting rights, he was able to see the apology in 2006. Unfortunately neither his father nor mother were not eligible for a head tax ex-gratia payment because they pre-deceased the apology, dying around 1925 and 1975. A proper and meaningful apology by the BC Government should be done with respect to the descendants of the original Head Tax payers, and not simply used as a method to woo votes from a growing list of voters who are recent immigrants who have no experience of the hardships of the Head Tax and Exclusion Act periods of BC history. This entry was posted in Uncategorized on February 28, 2013 by admin. I wanted to let you know that Today’s Globe & Mail, features an obituary on Harry Aoki, who passed away on January 24th 2013, at age 91. Harry Aoki and guitarist-singer Jim Johnson on their 1968 CBC-TV series, Moods of Man. The character of Steven Nakane in both Joy Kogawa’s Obasan and Naomi’s Road – was partly inspired/based on Harry Aoki. Joy Kogawa first heard of Mr. Aoki while listening to CJOC radio from Lethbridge, during her own internment. They met years later and, when writing her celebrated novel, Obasan, Ms. Kogawa thought of Harry the wonderful musician and made the character Stephen a composite of him and her own brother. He was 80 when he started the monthly world music get-together, First Friday Forum, bringing together musicians from all cultures and disciplines to play and talk. The monthly jam attracted musicians from around the globe – it was not uncommon to find artists from Russia, Mexico, Indonesia and India jamming away. Among them were African drummer Tembo Tano, Celtic violinist Max Nguen and Japanese flautist Chieko Konishi-Louie. 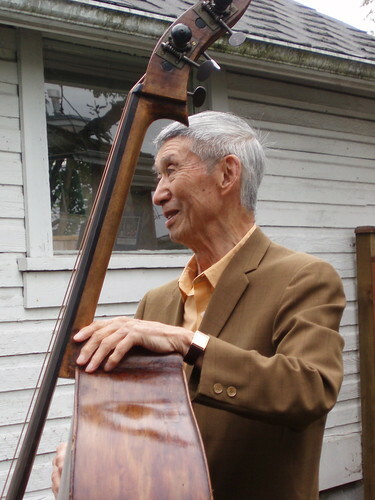 On March 1st, Friday, 6-10pm – There will be a Celebration of Life musical tribute for First Friday Forum – held at St. John’s College, UBC, for Harry Aoki. This entry was posted in Music, Uncategorized and tagged Harry Aoki, Kogawa House on February 20, 2013 by admin. Last week…. I read Joy’s email message about Harry…. at the First Friday Forum on Feb 1st…. Harry’s monthly music session. I read it from my cell phone… and people enjoyed it. Many commented that they never knew that Harry had helped inspire the character of Stephen Nakane, and others said they would read Obasan again. It was a good evening… and I played on my accordion the song “Neil Gow’s Lament for his Second Wife” and Maxwell Ngai accompanied me on violin. This was the first session since Harry’s Passing. The next session will be March 1st at St. John’s College at UBC, and it will be a musical tribute to Harry, and a celebration of his life. This morning there was the funeral service at the Vancouver Crematorium 9:30 to 10am… but we started arriving at 9am, and left by 10:30am. Upon arrival – there was music playing from Harry’s album with Jim Johnson – “The Many Moods of Man”. Themba Tana introduced himself and explained that the service would be simple with Zen Buddhist chanting. Ken Keneda read a note from Harry’s Niece in California… and he placed Harry’s harmonica and eye glasses in the coffin. Next, Ken invited people to come up to pay their respects to Harry and place their personal notes inside the open casket, along with the chrysanthemums everybody had received. Themba Tana played his african finger drum. After Harry’s coffin was wheeled out of the room… people were invited to say a few words…. Nobody stepped forward – initially. but I brought up John Endo Greenaway – who had wanted to say that Harry would be featured in the next edition of the JCCA Bulletin. I had arranged with Ken Keneda to read a Joy Kogawa poem…. as I had previously told him that the last time I was at the Vancouver Crematorium was for a music performance by my friend Heather Pawsey. Heather sang poems of Joy Kogawa that had been turned into songs by composer Leslie Uyeda, and performed with pianist Rachel Kiyo Iwaasa and flautist Kathryn Cernauskas – All who had all performed at Kogawa House before. I especially love the picture of Harry & Joe McDonald — Uncle’s not playing…he’s watching Joe on his riff on the piano. Uncle Harry loved to create music with fellow musicians — to see where the music might take everyone. It was always that musical journey that I think was the core of his greatness as a composer and especially as an arranger. The dialogue between not just instruments, but the cultures of the players and what each would bring. And in live performance, it is the ephemeral nature of the art – that once played, it can never ever be played that way again. There is a kind of magic in music – which is why Harry always said that music is one of the first places where racism breaks down. When you’re jamming with another musician, and you’re really in it, colour, religion and barriers just fall away. It’s just music. And if you’re lucky enough to listen to real musicians making real music – you escape the barriers that divide us. It was that phenomenological approach to music and to art that made Uncle Harry so interesting and special….and so you – his fellow musicians. You are musicians and weavers of a trans-cultural fabric that may be the only way we have left to make real change in the world. I didn’t realize that Uncle’s passing was the eve of Robbie Burns Day. Another artist who championed the cause of people in diaspora. (I’m guessing you’ve figured out by my name that I’m half Scottish and half Japanese) — so Robbie Burns is one of my favourite poets. This entry was posted in Multicultural events, Music, Uncategorized and tagged Harry Aoki on February 19, 2013 by admin. Happy Lunar New Year to everybody! Here is the Joy TV News video that is currently running on Joy TV – Check it out! Thank you videographer Dean Atwal for checking out our celebratory event. 4) Both suggest paying off all your debts before the New Year. This entry was posted in Asian Canadian Cultural Events, Chinese New Year, Multicultural events, Uncategorized on February 10, 2013 by admin. This is one of my favorite pictures of Harry. It was the first open house event at Kogawa House. And we had a musical surprise for Joy Kogawa, playing “The Farewell Song” from the Naomi’s Road opera, with soprano Jessical Cheung, guitarist Masaki Watanabe, and accordionist Todd Wong. Joy has shared that she based the musician character of Stephen Nagai in her novel Obasan, partly inspired by Harry. – photo by Deb Martin. Harry passed away peacefully on January 24, 2013 at the age of 91. Harry experienced a varied career well into the 80’s. He was a logger, timber cruiser, ski instructor, B.C. Electric systems analyst, teacher, musician, conductor, arranger and composer, recording artist, musicologist, band leader, impresario, advocate for social justice, traveller, and pioneer in the field of world music. During the 1960’s, together with good friend James Johnson, Harry operated a family oriented “folk” coffee house in Qualicum Beach. The duo hosted the CBC TV show “Moods of Man” that featured folk, jazz, blues, and classical music. This was followed by tours of the U.S.A. college circuit with their menu of multi-cultural folk music. In 1978, he was musical director for the opening ceremonies of the Commonwealth Games in Edmonton. Later in life, Harry was honoured by the Asia Pacific Foundation with the “Living Heritage” award in recognition of his contribution towards preserving traditional Asian culture for the enjoyment and enrichment of future generations of Canadians. His vision of intercultural harmony through the arts survives in the countless lives he touched and the loyal friends and communities that he brought together. His passing is a deep loss, but his work and legacy will live on. Harry leaves this world in accordance with his own vision of being true to oneself. No service will be held by his request, but there will be a private family gathering at a later date. In addition Harry’s friends are invited to attend a brief gathering at the Vancouver Crematorium chapel, 5505 Fraser Street, Vancouver, on Saturday, February 9 at 9:30 AM. Harry was predeceased by brother Dr. Ted Aoki. He is survived by brother Tats Aoki and sisters Mary Malcolm and Judy Matsuba. In lieu of flowers, donations to the Aoki Legacy Fund established through the Friends of Harry Aoki in partnership with St. John’s College at UBC (http:/ /stjohns.ubc.ca/), or to a cause of your choice will be deeply appreciated. Share memories of Harry at www.dignitymemorial.com. This was the first session since Harry’s Passing.We played songs and shared stories of Harry. It was a good evening… and I played on my accordion the song “Neil Gow’s Lament for his Second Wife” and Maxwell Ngai accompanied me on violin. I read Joy Kogawa’s email message about Harry…. I read it from my cell phone… and people enjoyed it. Many commented that they never knew that Harry had helped inspire the character of Stephen Nakane, and others said they would read Obasan again. The next session will be March 1st at St. John’s College at UBC and it will be a musical tribute to Harry, and it will be Celebration of Life. Here is a Harry playing Star Dust on his harmonica, accompanied by my friend Joe McDonald. The occasion was my 50th Birthday party in 2010. Harry enjoyed himself, and even got a chance to play with my friends in the celtic ceilidh group The Black Bear Rebels, as he picked up Jay MacDonald’s double bass to join in on some songs. – photo Patrick Tam Flunging Pictures. Service for Harry at the Vancouver Crematorium. Themba Tana introduced himself and explained how that service would be simple with Zen Buddhist chanting. People were asked to sign the guest book that Harry’s niece Catherine, had created with pictures of Harry’s life. Ken Keneda explained that people could write their thoughts on pieces of paper, and place them into the open casket with the chrysanthems that each person was given. Ken then read a note from Harry’s Niece in California… and he placed Harry’s harmonica and eye glasses in the coffin, while Themba Tana played his african finger drum. After Harry’s coffin was wheeled out of the room… people were invited to say a few words. Nobody stepped forward – initially. But I brought up John Endo Greenaway – who had wanted to say that Harry would be featured in the next edition of the JCCA Bulletin. I had arranged with Ken Keneda to read a Joy Kogawa poem, as I had previously told Ken that the last time was I was at the Crematorium had been for a concert performance by soprano Heather Pawsey, pianist Rachel Kiyo Iwaasa and flautist Kathryn Cernauskas, who had all performed at Kogawa House before. They had performed poems by author Joy Kogawa, turned into songs by composer Leslie Uyeda. But I couldn’t remember which songs they had been. But, I found an appropriate poem by Joy that I could read, titled Where There’s a Wall”. A bouzouki player from Glasgow dropped into the Lynn Valley Legion…. and found the Black Bear Rebels playing…. This entry was posted in Uncategorized on February 8, 2013 by admin. Harry Hiro-o Aoki was a musical pioneer. He was born in Cumberland in 1921. After being interned with other Japanese-Canadians during WW2, Harry made it his life’s work to bring cultures together through music. He passed away January 24, 2013. The Aoki Legacy Fund was established to carry on his work. This entry was posted in Uncategorized on February 3, 2013 by admin. future. Who is most worthy? Who deserves a second chance? dimension of quirkiness to the play. shows from the Victoria based Atomic Vaudeville company. This entry was posted in Uncategorized on February 1, 2013 by admin.